My wife and I often talk about writing a book about the films you need to see to get the jokes. 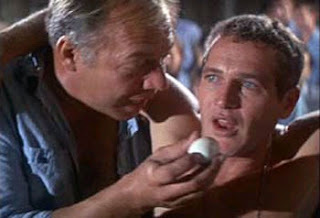 When I actually start work on it, the first subject will likely be Cool Hand Luke starring Paul Newman. The famous line, “What we have here is… failure to communicate,” has permeated all aspects of pop culture from the song “Civil War” by Guns ‘n’ Roses to CSI’s “what we’ve got here is… failure to coagulate” to Internet commentary on a recent vice presidential debate. Cool Hand Luke opens with Luke cutting the heads off of parking meters. He doesn’t seem to be after the measly pocket change they hold though. They just topple off their posts and clank to the sidewalk. And when the police inevitably appear, he simply welcomes them with a smile. It’s his first of many attempts to communicate. What he is trying to communicate is wisely left to our imaginations. From there, Cool Hand follows Luke through three similar but escalating failures to communicate. Made in 1967, writers Donn Pearce and Frank Pierson and director Stuart Rosenberg were likely using the film and the inarticulate Luke to express the frustration felt by many after the assassination of JFK and during the Vietnam War. And Luke suffers greatly for their cause. Luke and a big, burly leader of the inmates called Dragline have a fist fight. Luke gets in his licks, but he’s no match. Every time Dragline knocks him down and every time another inmate pleads with him to stay down, he just wordlessly gets back up and keeps swinging. He’s filled with resigned desperation as if trying to express something inexpressible. Urgency mounts during the famous scene where Luke boasts he can eat 50 eggs, the gastronomic suffering feeling unbearable. And then the final escalation follows his repeated attempts at prison escape, and the ensuing punishments. More than anything, Luke seems like a child as he gradually presses closer and closer to his parents’ limits, as many young people in America were similarly questioning authority. Being saddened by Newman’s recent passing, there is a montage near film’s end that had me in tears. All of the moments from the film where Luke is caught smiling – and there are many – are spliced together. It’s a beautiful series of moments. As if Newman through Luke was communicating directly to me from the beyond. It is a fitting farewell to a great American icon.